of the rocket's large mass in opposite direction. Momentum is mass times velocity, m × v.
Momentum is a conserved quantity. total momentum of entire system remains constant. is the same as the total momentum after the collision. Any momentum lost by object A goes to object B. Product of large mass × slow velocity will equal product of small mass × fast velocity. 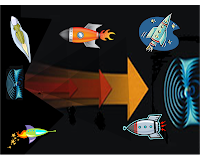 1) For every second of powered flight, space vessel's speed increases by 10 meters per second (m/s) . Thus, Vship is a constant 10 m/s. This value coincides with g, acceleration due to gravity near Earth’s surface. Thus, TE assumes our notional spaceship can expel enough high speed particles to provide gravity equivalence throughout the flight. This simulates Earth gravity for ship and contents. 2) Let the fuel consumption be one gram of particles for every second of powered space flight. I.e., set mfuel to a constant 1.0 gram. 3) Assume spaceship's propulsion uses an onboard particle accelerator to give exhaust fuel particles extremely high speeds. Since current devices easily accelerate particles to 99% of light speed, our thought experiment will eventually sustain fuel exhaust velocity, vfuel, to near light speed, c.
4) Rename the vfuel term as "vExh" to more clearly indicate exhaust velocity of particles exiting vessel. We choose to independently vary vExh by incrementally increasing from row to row in the following tables. Thus, vExh is our Independent Variable (IV). mfuel, exhaust particles, in grams. For consistency, TABLE-1 uses grams and meters per second (m/s) on both sides of momentum exchange equation. Solve for Mship to determine how much ship's mass can be propelled 10 m/s by a given mass of high speed fuel particles in opposite direction. Since Mship depends on the value of vExh, Mship is our Dependent Variable (DV). Thus, total momentum of a system of objects is "conserved"; total amount of mass times velocity is static. To further understand momentum conservation, consider Newton's Law of Momentum Conservation. When two objects collide, the forces acting between the two objects are equal in magnitude and opposite in direction. 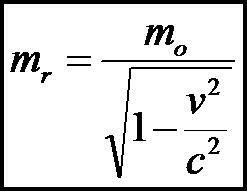 In equation form, m*v = -M * V.
The forces between the two objects are equal in magnitude and opposite in direction, which leads to Newton's Law of Momentum Conservation. In a collision, the momentum change of object A is equal and opposite to the momentum change of object B. That is, the momentum lost by object A is equal to the momentum gained by object B. 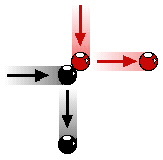 In a collision between two objects, one object slows down and loses momentum while the other object speeds up and gains momentum. If object A loses 75 units of momentum, then object B gains 75 units of momentum. Yet, the total momentum of the two objects (object A plus object B) is the same before the collision as it is after the collision; the total momentum of the system (the collection of two objects) is conserved. For any collision occurring in an isolated system, momentum is conserved - the total amount of momentum of the collection of objects in the system is the same before the collision as after the collision. This exchange can be readily observed by watching billiard balls collide. however, two terms, vExh and MShip, have a lot of inconvenient digits. simplify this process by mixing some units. For convenience, mix different velocity units. In particular, we'd like to continue expressing ship's velocity increase, VShip, as 10 meters per second (m/s); but we'd like to change vExh units from meters per second to decimal light speed, dc c, where c remains the light speed constant, c = 299,792,458 m/sec; and dc is the variable decimal component. For convenience, change from consistent units (grams and m/s) to mixed terms. Thus, express Mship in mT and vExh in decimal c.
Mass Fuel (mFuel) remains the given constant, 1 gm. Fuel Velocity (vfuel) becomes dc c with c as light speed constant, and decimal component (dc) becomes Independent Variable (IV). Ship Velocity (Vship) remains constant 10 m/s for every second of powered flight. 300 is resulting conversion constant which replaces "c", the light speed constant. Since definition of acceleration is velocity increase per time, Vship per second is an acceleration. We've chosen Vship to be 10 m/s for every second of powered flight; this is same value as g, acceleration due to Earth's surface gravity. Further, we can introduce new term, fuel flow per sec (ffsec), and substitute for the expression: mfuel/sec . Thus far, we've arbitrarily assigned a constant value of 1 gram per second to m fuel /sec (now "ffsec"); however, this term can be any value. Express exhaust particles velocity, vExh, as "decimal light speed", dc c.
Express Term, c/g, as a constant. "Sec"s cancel out; however, use "fuel flow" term (ffsec) to reinforce concept of fuel quantity used in a second; but expressed in grams. (not gm/sec). and fuel particle exhaust velocity are independent variables. With Newtonian mechanics, we propose that expelling one gram of high speed particles (ffsec) at a velocity of .1 c (vExh) is sufficient to propel a 3 metric Tonne (mT) ship (Mship) at 1-g-force for one second. We now propose that at near light speeds; relativistic effects further increase the propulsion. To quantity this mass increase due to near light speeds, we use the Lorentz Transform. Lorentz was awarded the Nobel Prize in 1902, but his subsequent "Lorentz Transformation" (LT, published 1904) was based on electromagnetic forces between charges slightly changing due to their motion, causing moving bodies to slightly contract. Among other things, LT paved the way for Einstein's special theory of relativity, which was published 1905, the year after Lorentz published his famous transform. (Einstein’s Nobel Prize awarded 1921). Of course, relativistic effects are due to nature of matter discovered by Einstein’s famous e=mc2 equation. These relativistic effects can be quantified and measured by using the equation associated with the Lorentz Transform (LT). For example, if a small original mass (mo) could accelerate in a particle accelerator to a significant portion of c, speed of light; its size would grow to relativistic mass (mr) as shown by equation at left, Lorentz Transform. For very small values of v (say speed of bullets, 1 km/s, or even slower speed of automobile, 100 km/hr = .028 km/s), v is so much less then c, 300,000 kilometers per sec, that LT's radical expression is extremely close to one (1.0) with virtually no mass increase. Thus, for everyday speeds, moving mass equals original mass. Simplify by reducing the ratio dc2c2/c2 to dc2. Consequently, TE assumes there is a relativistic increase in exhaust particle mass; furthermore, TE assumes this mas increase further increases propulsion effect. To quickly realize significance of Lorentz Transform (LT), arbitrarily pick a speed much higher then what we observe everyday; for example, one half the speed of light or .5 c for following equations. After particle accelerates to .5c, the mass increases an observable 15%. TABLE-5 shows even greater increases for even higher speeds. Replace term, c/g, with conversion constant 30.57×106. TABLE-4 maintains ffSec at constant 1 gm/sec. to increase both momentum and propulsion capability. 86.6% of light speed, c, doubles their mass. 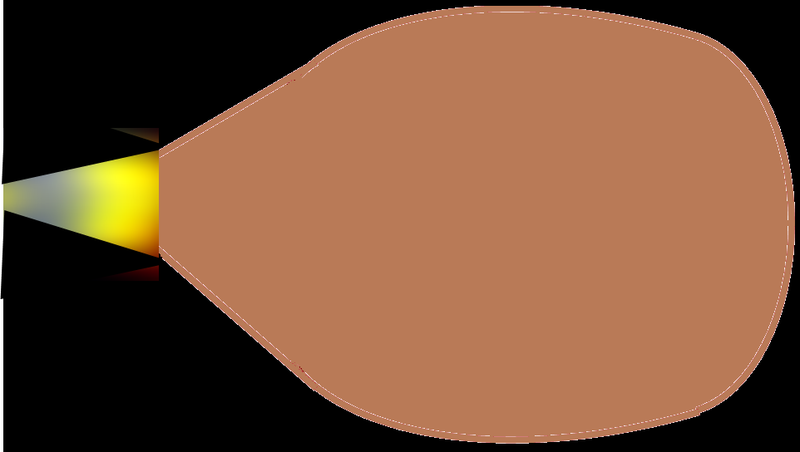 94.3% of c increases their mass three fold. 96.8% increases it 4 times!!! Thus far, we've taken the Momentum Conservation equation and applied it for a duration of one second. Micro-scale. Spread the amount of fuel ejected in a smooth continuous manner throughout the entire second. Both above items are easily done now in various modes of transportation, (for example, the typical plane, train, and automobile have done this for many years). However, can micro/macro scale energy conversion be done for exhaust particles accelerated to large portions of c, speed of light??? Nuclear Space Power and Propulsion Systems (Progress in Astronautics and Aeronautics) by Claudio Bruno(Editor).